When the textile mill in Glen Kerry, Ireland, is closed, Fiona’s family accepts passage to Chicago to work as servants for the family who paid their fares. 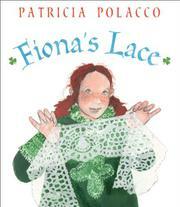 Fiona spends the endless journey making lace as her mother taught her. She and her sister, Ailish, love the oft-told story of how their father met their mother, when she tied bits of her lace in a trail from the mill to her home so he could be introduced properly. Since the family gets no wages until they pay off their passages, the parents must take other jobs after hours, but Fiona’s lace finds a market, and the family is able to save toward buying land in Michigan. But one evening, when Fiona is making lace and her parents are out working, a fire (the great Chicago fire of 1871) breaks out near their tenement. Fiona and Ailish escape with the lace, which Fiona uses to mark a path so their parents can find them, just as their father found their mother. Polacco weaves her themes well: immigrant history, family lore, poverty and oppression, and hope for the future. The greens of Ireland are beautifully pictured, and the dun and gray of the Chicago tenements are brightened by the sweetness of the lace patterns and the girls’ red hair.